Awakening from seven years of slumber, a new version of Painter Essentials has finally hit the streets. Targeted toward hobbyists, art enthusiasts and emerging photo painters, Painter Essentials 5 was redesigned to be smoking fast and far easier to use. It includes a whopping 31 new and useful brushes—including some of Painter 2015’s hot new Particle Brushes—plus two new tools for creating mirror and kaleidoscope paintings, a vastly improved photo painting engine, a powerful brush-tracking utility, real-time effect previews, and more. Whether you’re an aspiring artist or a photographer, there’s a lot to enjoy in this new release. The 64-bit and Apple Retina-happy Painter Essentials 5 was rebuilt from the ground up using the new code base of its pro-level sibling, Painter 2015. Its simplified, floating-panel based interface exudes a friendly and uncluttered feel. A welcome screen helps those new to the app get started quickly—you can choose to create a new painting or drawing, open one you’ve already started, create photo art (incredible fun! ), pop open a handy QuickStart guide, or visit Corel online. 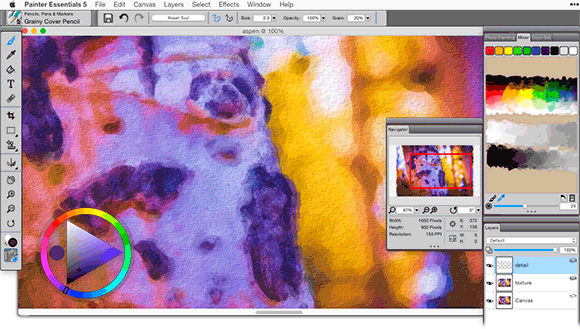 Painter Essentials 5’s new and simplified interface, shown here with a painting of an aspen tree. Also new is a Navigator panel for zooming in and out of a painting, as well as spatially orienting yourself or repositioning once you’re zoomed in, and the same incredibly powerful brush-tracking utility that’s in Painter 2015. This utility visualizes your calibrating brushstroke as a power curve that you can fine-tune with sliders in order to control the point in your stroke where you achieve maximum pressure, how fast the pressure increases, and more. You can also save brush-tracking settings as a preset. It’s a rare occasion when the consumer version of a pro-level program becomes more advanced than its sibling, but that’s the case with Painter Essential 5’s enhanced photo painting feature. Even those new to the program can create an outrageously realistic painting from a photo in no time flat. 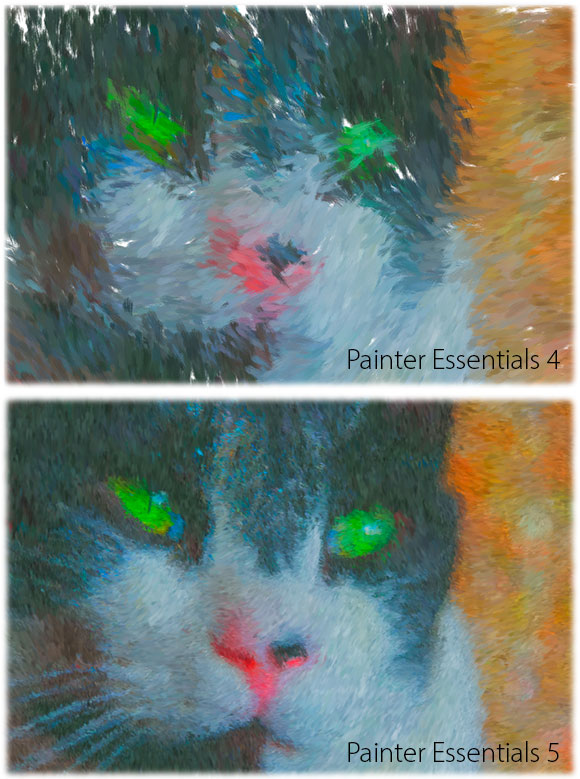 As you can see here, the result of a photo painting in Painter Essentials 5 is vastly improved from the previous version (Impressionist style was used here on your author’s cat, Sherlock). The insanely simple painting process goes like this: Use the Photo Painting panel to open a photo, pick from 11 painting style presets, and then click the Play button. Next, watch in amazement, and enjoy a beverage, as the program paints millions of brushstrokes right before your eyes. When the painting’s finished, the Soft-Cloner brush activates itself, allowing you to paint over areas in order to restore details from the photo, especially handy for eyes and faces. Here are the results of the Oil Painting (top) and Colored Pencil Drawing (bottom) presets, though the latter includes a paper texture applied to a new layer filled with gray. The whole photo painting process is shockingly fast, even on large file sizes. The only tiny downside is that there’s no photo painting status bar, so it can be tough to know when the program is finished painting, especially when using the pencil-based presets with really thin strokes. You can customize the photo painting in myriad ways, too. For example, you can add your own brushstrokes—with or without the tracing paper (original photo) visible—as well as experiment with a variety of effects with real-time previews (Color Overlay and Quick Warp effects are new in this version). The auto-tracing feature works in a similar 3-step fashion, and is loads of fun for the young or young at heart. Painter Essentials 5 sports 31 new brushes, for a grand tally of 126. 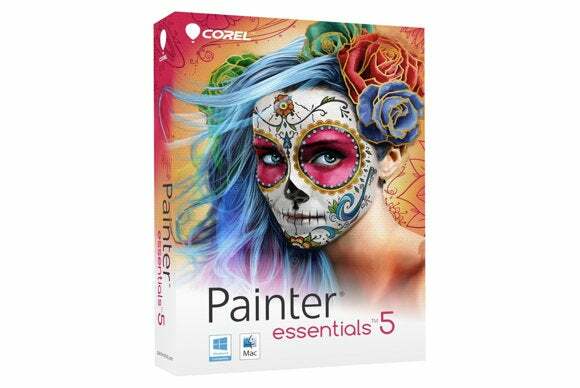 (In comparison, Painter 2015 has 806, though at a price point of $429, you pay for them.) The Brush panel, now nicely tucked into the upper-left corner, opens to reveal 12 brush categories with a handy row of recently used brushes perched up top and a nice brush tip preview gracing the bottom of the panel. Among the new brushes are a subset of the mind-blowing Particle Brushes that debuted earlier this year in Painter 2015, which you can use to create realistic fur, fabric, and so on—unfortunately, Painter 2015’s super-slick Particle Spring Fireball brush isn’t included. These revolutionary brushes work according to the laws of physics and, when you paint with them, a bubbling array of speckled particles emanates from the brush tip to produce random and chaotic patterns, lines, and colors as you move or hold your stylus in place (a stylus is the pen used with digital drawing tablets, like those from Wacom). Painter Essentials 5 also sports new Jitter Brushes, two new tools for creating a mirror and kaleidoscope painting, a variety of tools for transforming selections (think scaling, rotating, skewing, distorting, and so on), enhanced paper textures, and better support for Wacom digital drawing tablets. 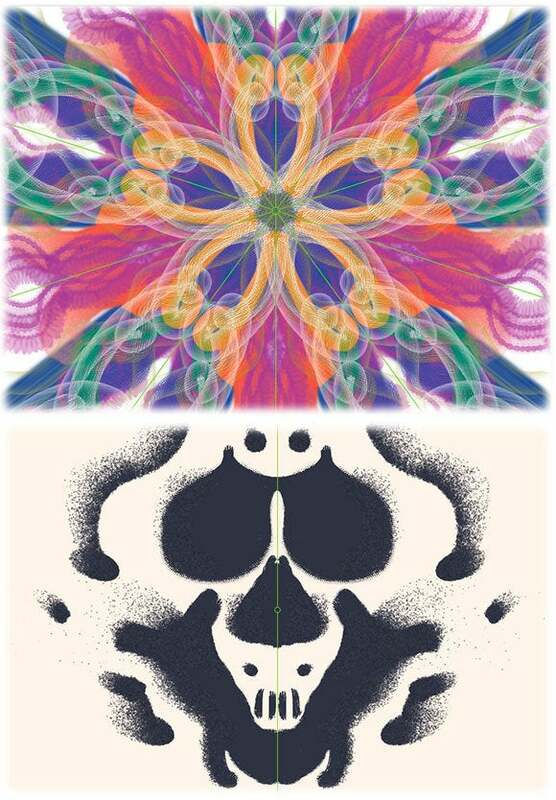 Using Painter Essentials 5’s new Kaleidoscope (top) and Mirror (bottom) tools, you can quickly create unique designs. If you’ve ever wanted to try your hand at painting, or if you’re a photographer who’s longed to turn a photo into a realistic painting (a viable product to sell in your photography business), then this is the program for you. 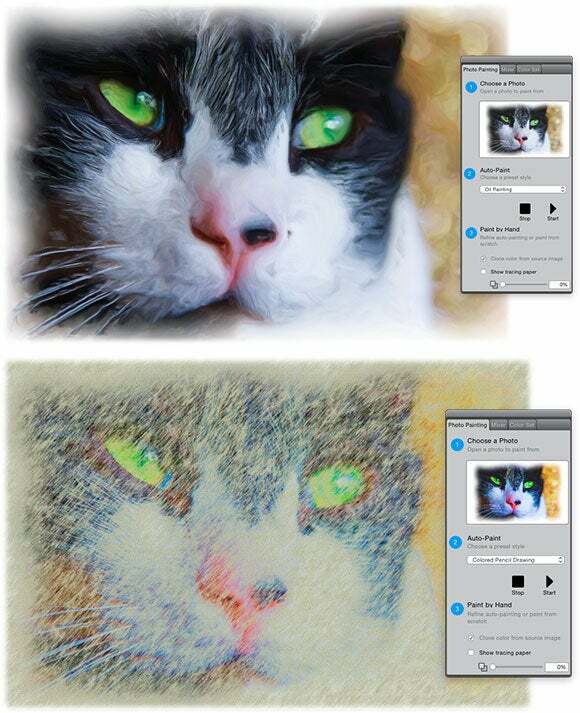 While Painter Essentials 5 includes numerous and useful enhancements, its photo painting feature alone is worth $50. Besides, this is the only consumer-level program on the planet that gives you real-world painting power in digital form. So, if you’ve got an extra $50, consider Painter Essentials 5 the perfect artistic and inspirational gift…even if it’s to yourself. While Painter Essentials 5 includes numerous and useful enhancements, its photo painting feature alone is worth the price of admission.